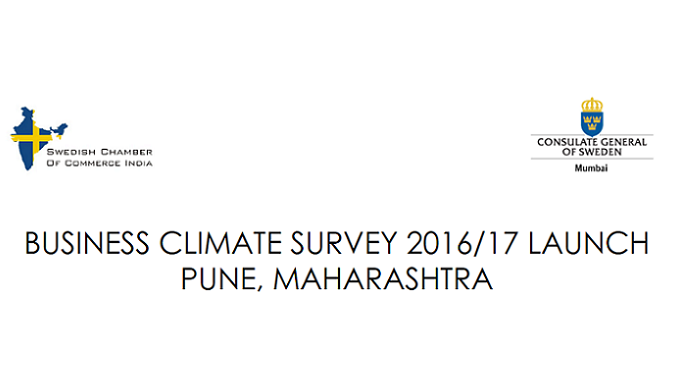 In the end of February, a presentation and discussion of the Business Climate Survey 2016-17 result was made in Pune. This discussion served as input to recent high-level interactions, between the Chamber and Indian government on “ease of doing business” and formed the base for the report that has now been completed. The report was launched on May 17 by Minister of EU Affairs and Trade, Ann Linde. Take this opportunity to hear more about the business climate, discuss some of the key areas for us as a business community going forward and especially in Maharashtra. The chief guest for this occasion is Mr. Sunil Porwal, Additional Chief Secretary (Industries), Government of Maharashtra. Your copy of the Business Climate Survey 2016-17 will be waiting for you at the venue!